Having read about Enchaud Périgourdin in an old cookbook, I was so happy to finally taste it in Périgord. Once I had tried it, I never looked back—it is so simple. The pork is spiked with sticks of garlic and then roasted en cocotte with just a bit of broth in a covered casserole, so the meat stays moist and tasty. Carrots and parsnips are added halfway through the cooking, so they cook to just the right tenderness. The pork is also excellent cold: thin slices, spread with the jelled cooking juices and topped with some cornichons, make a robust sandwich between slices of country bread. Posted by Chronicle Books • Published 21st September 2010 • See Chronicle Books's 41 projects » © 2019 Anne Willan / Chronicle Books · Reproduced with permission. Start preparing the pork at least 6 hours ahead of cooking. Poke evenly spaced holes all over the meat with the tip of a small knife. Insert a garlic stick in each one. Roll the pork, tie it in a neat cylinder, and sprinkle it with salt and pepper. Refrigerate the pork for at least 6 hours or up to overnight, so the garlic permeates the meat. The next day, heat the oven to 350˚F/180˚C. Heat the lard in a flameproof casserole over medium heat. Add the pork and brown well on all sides, taking about 20 minutes. Pour 1 cup/250 ml of the broth over the pork, add the thyme, and cover the pan. 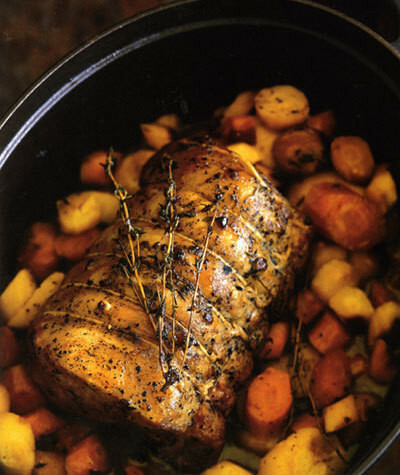 Roast in the oven, turning the meat occasionally, for 30 minutes. At this point, the pan juices should be brown. If not, remove the pork and boil the pan juices on the stove top until they are reduced to a glaze that will add color to the carrots and parsnips. Stir in the carrots and parsnips with the remaining broth, sprinkle the vegetables with salt and pepper, and set the pork on top. Re-cover the pan, and continue roasting until the pork is very tender and the vegetables are done, 45 minutes to 1 hour longer. A skewer inserted into the center of the meat should be hot to the touch when withdrawn after 30 seconds, or a thermometer should register 160ËšF/70ËšC. Baste and turn the meat 2 or 3 times during cooking, and add more broth if the pan seems dry. The meat and vegetables may be refrigerated for up to 2 days. To finish, if necessary, reheat the pork and vegetables in the casserole on the stove top over low heat, allowing 20 to 25 minutes. Transfer the meat to a carving board and cover with aluminum foil to keep warm. Lift out the vegetables with a draining spoon and spread them on a platter. Cover with foil to keep warm. Strain the pan juices into a small saucepan, and skim off any excess fat. Boil the juices to reduce and concentrate if necessary. Taste and adjust the seasoning. Discard the trussing strings from the pork and carve into thick slices Arrange the slices, overlapping them, on the carrots and parsnips. Moisten the pork and vegetables with a little of the pan juices and serve the rest separately.